Despite the fact that she genuinely likes to fish, my wife Hanna really doesn’t get excited about fishing tackle. She gets in the boat, or goes on vacation, and it magically appears, and usually it’s pretty good stuff. Meanwhile, I am obsessed with it, and hell bent on amassing an unsurpassed selection. That’s why it is one of life’s injustices that I rarely make it to the Bassmaster Classic Expo while she usually gets two full days there. This year it turned out that I got two full hours at the show on Saturday, but by the time I visited all of the people I wanted to see, there was only a short period left to make a single purchase. Thus tempted, but left unfulfilled, I told her that her job for Sunday was to make a few purchases. I left no instructions beyond that, so I was concerned that she’d come back with a selection of potpourri or some Cutco knives rather than anything useful. While she didn’t come back with a thousand dollar credit card charge and a backpack full of footlong swimbaits and shimmy worms, she played upon her strengths. Rather than trying to intuit which lures we needed (and did not already have), she furthered her 15-year Sisyphean effort to organize my stuff. That led her to the booth of Gruv Fishing, where she purchased a number of silicone lure anchors that hold hard baits and jigs in place. It’s a system that is particularly valuable for someone like me, who spends the winter getting every item in its proper place, then spends the first trip out getting it all mixed up again for the remainder of the year. Fortunately, I had a few hard baits in the hotel room, so I placed them in the grooves (gruvs?) and sat there shaking them like a fool. So far, so good, no trebles in the eye. 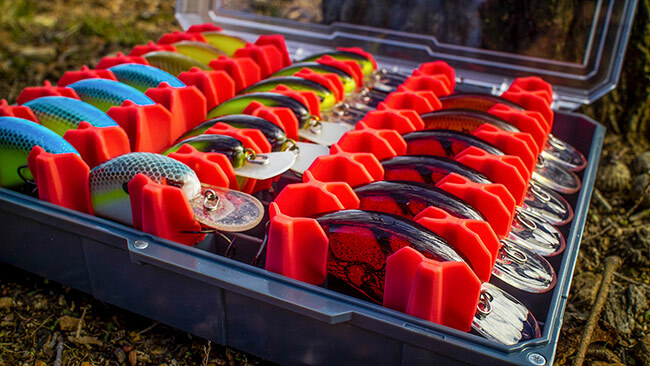 I’ve been looking for some way to keep hard baits at the ready inside the storage bins on my boat without having to drill holes in the compartment lids, and these Gruv systems look like a promising possibility. Next time I hope she spends more.